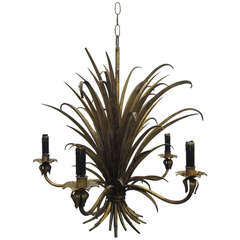 A handsome Italian eight-light hanging light fixture or chandelier or pendant light of gilt metal featuring a wheat sheaf (wheatsheaf) design, with floral bobeches and lovely foliate scroll accents. Measures: 28 1/2 inches diameter U.S. wired, ready for display. 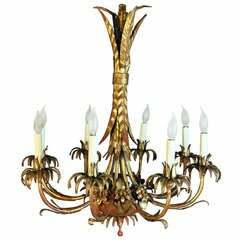 Remarkable Italian leafy Hollywood Regency gold gilt iron toleware 8 light chandelier with stunning wheat sheaf form and beautiful patina to the gold gilt frame. 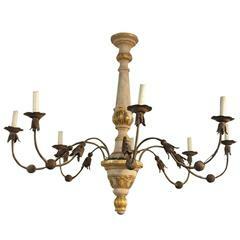 Five-arm sheaf of wheat metal chandelier. 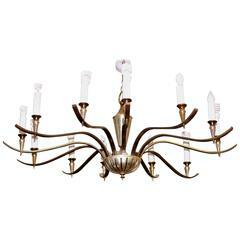 Large twelve arm Mid-Century Modern chandelier. Brass and white brass.60&quot; diameter. 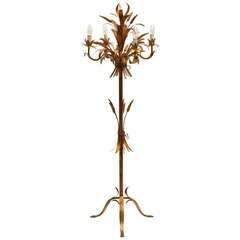 Italian gilt metal sheaf of wheat floor lamp. 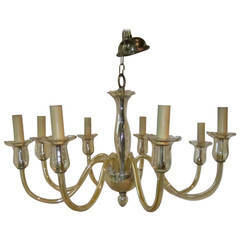 1940s Italian eight-arm Murano glass chandelier with beveled bobeche. Recently rewired for the U.S. Ceiling cap is provided. Excellent condition.